Low season in Malaga continues in the shortest month of the year, but even if it only has 28 days February is a good month to visit Malaga. Read on for our pick of experiences, tastes, activities and events for inspiration for things to do in Malaga in February. One of the most colourful events in Malaga in the year and the one where you can really let your hair down is Carnival. The 10-days of celebration see singing, dancing, lots of fancy dress, drag queen competitions and general fun. Most of Spain mourns the end of Carnival with the burial of the sardine, but Malaga buries the anchovy (boquerón). 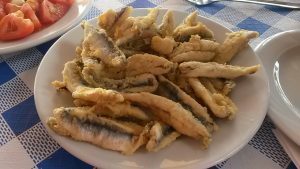 Make one of the things to do in Malaga in February to try some anchovies, pickled in vinegar, deep fried or incorporated into an innovative tapa. If you go for fried, don’t be put off by the bones – boquerones are so small you eat the whole fish. You might be surprised to discover that Malaga is something of a hot spot for birdwatching. And you don’t have to go far to see some interesting feathered friends – parakeets, kestrels and booted eagles fly the city centre skies regularly. For more variety especially towards the end of February, head for the Guadalhorce Nature Reserve. Read more about birdwatching in Malaga here. February in Malaga rings the changes at the big art museums. This is the time of year to check out the new exhibition at the Russian Museum, a whole collection of art work from the Museum of St Petersburg plus two temporary exhibitions. The Picasso Museum also hosts a new temporary exhibition in February. The Mediterranean is still on the chilly side, but the weather in February is certainly warm enough to bask in the sunshine and on the beach. Take your towel, pick your spot – the good news is that you’ll have most of the beach to yourself – and catch up on a spot of early sunbathing. Retail things to do in Malaga in February include shopping for the new season. Shops in most northern European countries bring in their spring stock in this month, but in Malaga you can buy it and then wear it because it’s warm enough! For a guide to where to go shopping in Malaga, click below. Mostly flat and very compact, Malaga makes a great city for walking. 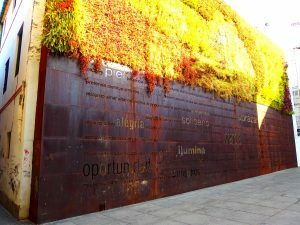 Our website includes a range of ideas for walking tours and for February, we recommend the tour round La Malagueta area. Time your walk with late afternoon and enjoy the sunset over the city from Muelle Uno. February is one of the best months to get out walking in Malaga. If you don’t have your own transport or fancy hiking up a mountain, walk a stretch of the Coastal Path. Known as the Senda Litoral, the path runs over 180km along the coastline of Malaga province from Manilva in the west and Nerja in the east. The path is mostly flat and includes Malaga seafront. Spend a day walking west to Torremolinos or Benalmádena or east to Rincón de la Victoria. Get the bus back to Malaga. Statistically February is one of the wettest times of the year. 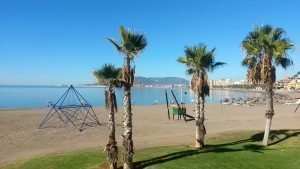 This means that on average you can expect 5 days of rain during the month – not many, we know, but you just might choose the wrong weekend for a holiday in Malaga. But if you do, don’t worry – there’s still plenty of things to do in Malaga. See our recommendations here. And don’t forget that the rain never lasts for long!